Home » Blog » Mr. Scotchman has Facebook figured. Mr. Scotchman has Facebook figured. In “friends Q&A,” a game that runs on Facebook, people answer questions about Facebook friends. The friends are subsequently asked to sign into the game page, after which questions and answers are revealed to them — but not who provided the answers. If you want to know who answered, you must pay “coins” earned by playing the game. I’m not intrigued enough to know who’s talking about me — yet — so I haven’t earned any coins, but I’ve viewed the questions — and answers — and they are interesting. One of the questions is “Do you think that Sandy Compton spends more than an hour on Facebook everyday?” The anonymous answerer said “No. And, they are right. Not every day, because I don’t turn my computer on every day, but on any given day that I do go to Facebook, I spend more than an hour there. Facebook is part of my job. Mr. Scotchman seems to be telling us that his place is "the wildest!" Admittedly, I have a fun job — most of the time. I’m paid to get the message out about the mission of Friends of Scotchman Peaks Wilderness through a variety of measures. Among other things, this includes monitoring, posting to and administrating the FSPW website, Facebook page and Twitter account. I spend part of my day putting things in Monty’s mouth. Monty, also known as Mr. Scotchman, is our mountain goat mascot; and, though I tend to anthropomorphise him on Facebook and Twitter, I try to remember that Monty’s name is one we gave him. Monty’s presence and that of other goats I have encountered in the Scotchmans have prompted me to learn more about Oreamnos americanus. These critters are a highly specialized and sensitive species found historically primarily on the west side of the Continental Divide of North America, from Colorado north to the Chugach Mountains of south-central Alaska. 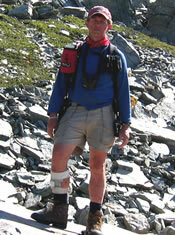 They have been successfully transplanted to mountains on the east side of the divide in Montana and Wyoming and into the Olympic Mountains on Washington’s Olympic Peninsula. They are relatives of antelopes, gazelles, chamois and musk oxen. They live in such harsh conditions that survival rate for kids under a year old is about 50%. They eat grasses, herbs, sedges and ferns in the summer. In winter, they fill their stomachs with twigs and conifer needles to allay hunger before searching out more nutritious mosses and lichens, which they will actually climb into the lower branches of trees to acquire. 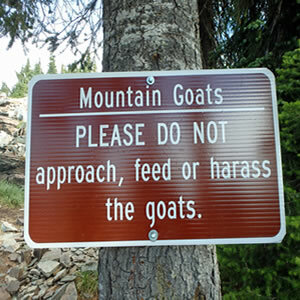 I’ve encountered goats in the Scotchmans and other places, including 11,000-foot Wheeler Peak in Colorado and at Evan’s Landing near lake level on Lake Pend Oreille, and it always seems to be a transcendent moment when I do. In mid autumn, when their coats are in full glory from rich grazing in high meadows, they are nearly incandescent. I have also seen them rag-tag in the midst of shedding, looking like sheep that escaped the shearer half-way through the process, trailing goat-wool in ratty strings that catch on whatever they pass by. Wherever and whenever I encounter them, I am struck by their seeming serenity. Only when there are kids to protect do they seem to get agitated, though I remember a big billy in the Spar Creek drainage who got excited enough to lower his head and paw when approached too closely. This old boy turned away, finally, and began up the face of Spar Peak, standing on his back legs to place his front feet on the next ledge and then muscling himself one more step up the pinnacle. After watching him for a while, it occurred to us watching him that his back legs were not working well — as props only — but he still managed to progress quickly up that rampart using primarily his front legs. He was the classic “old goat,” whose impending winter was more than likely his last. Goats have a relatively short life span, only 12 to 15 years. We don’t know how old our old goat is, but we do know that he has never come to us at the top of the Scotchman Peak trail and said, “Hi, I’m Mr. Scotchman, but my friends call me Monty.” And, he never will. He’s a mountain goat. However, his Facebook counterpart came up with something the other day I thought was pretty spectacular. 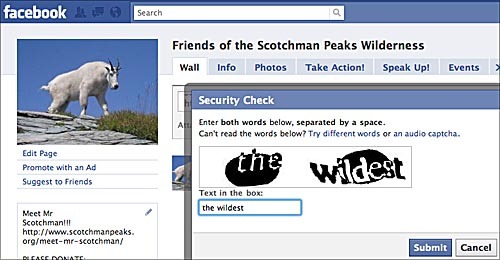 If you look at the picture, you will see that Facebook presented a couple of very appropriate “Security Check” words on the Scotchman Peaks page. It’s this kind of thing that makes me think I’m in the right job. It’s as if fate were at work here. It’s as if fate were at work here too.